Source: Donald N. Bigelow and Lyman H. Legters, NDEA Language and Area Centers: A Report on the First 5 Years. Washington, DC: U.S. Department of Health, Education, and Welfare, Office of Education, Bulletin 1964, No. 41, OE-56016, pages 23, 26, 28, 30, and 31. Source: from Richard D. Lambert, Language and Area Studies Review. Philadelphia, PA: American Academy of Political and Social Sciences, October 1973, p. 309. Source: United States, General Accounting Office, Study of Foreign Languages and Related Areas: Federal Support, Administration, Need: Report to the Congress. Washington, DC: General Accounting Office, 1978, pp. 5, 46. Source: Lorraine M. McDonnell, Sue E. Berryman, and Douglas Scott, Federal Support for International Studies: The Role of NDEA Title VI, p. 33. Santa Monica, CA: Rand Corporation, 1981, http://www.rand.org/pubs/reports/2009/R2770.pdf. 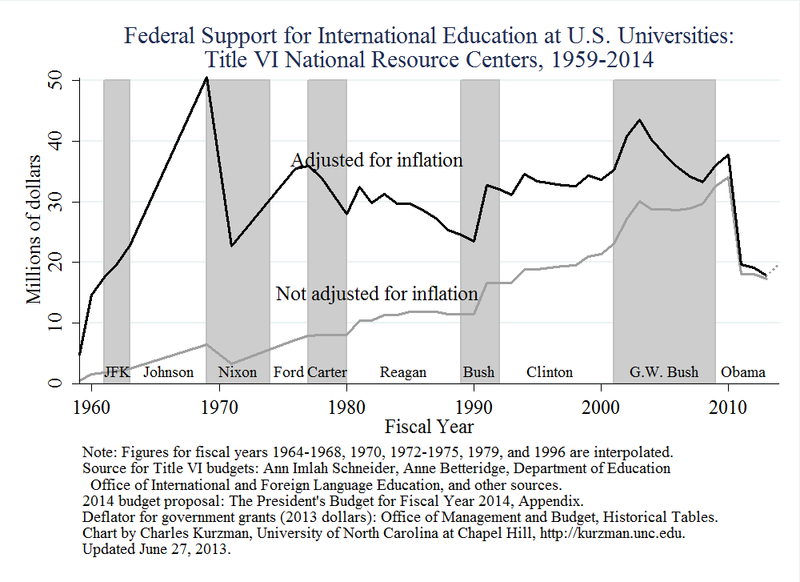 Source: Ann Imlah Schneider, Center for International Education, U.S. Department of Education, “Table III: Distribution of Title VI Support to National Resource Centers, 1959-1995, By World Area” (undated photocopy). 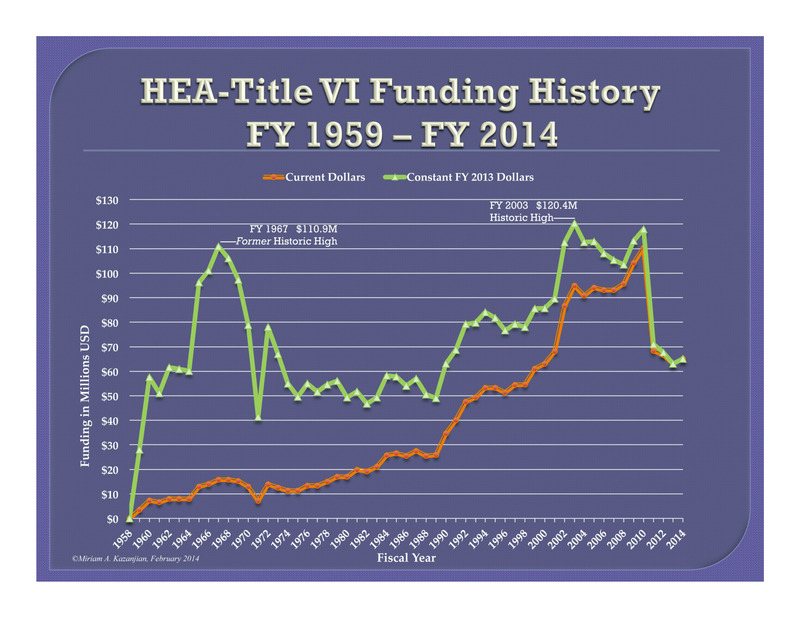 Thanks also to Anne Betteridge, “Distribution of Title VI Support to National Resource Centers, 1959-2010 (by percentage),” Excel spreadsheet, November 30, 2012. Source: Department of Education, Office of Postsecondary Education, Office of International and Foreign Language Education, “National Resource Center Funding FY 1997-99,” http://www2.ed.gov/programs/iegpsnrc/awards.html, accessed April 26, 2013. Source: Department of Education, Office of Postsecondary Education, Office of International and Foreign Language Education, “National Resource Centers Program, Funding Status,” http://www2.ed.gov/programs/iegpsnrc/funding.html, accessed April 26, 2013. Source: 4.6% sequester * FY 2012 total of $18,048,762. http://www.whitehouse.gov/sites/default/files/omb/budget/fy2014/assets/edu.pdf, accessed April 26, 2013. Adjustment for inflationSource: White House, Office of Management and Budget, Historical Tables, Table 10.1, “Gross Domestic Product and Deflators Used in the Historical Tables: 1940-2018,” column J, “Other Grants,” http://www.whitehouse.gov/omb/budget/Historicals, accessed April 22, 2013. Note: Fiscal Year 2005=1.000 is adjusted in the chart so that 2013=1.000.